The EAS Foundation for Honey Bee Research is a competitive grant program developed from donations received from beekeepers and others interested in funding research on topical problems in honey bees. Proposals are solicited annually with award amounts to be determined the spring before the EAS annual meeting. Requests for “seed money” to provide investigators the opportunity to collect preliminary data or as “add on” funds to combine with other funding sources to continue present research will also be considered. Requests for support for student projects (undergraduate summer employees/ graduate student) or for equipment/ supplies for distinct research projects are given highest priority. We welcome separate discrete project proposals and requests that identify pieces of ongoing research programs where additional funds can accomplish an objective of a larger program. Grant funds may be used for supplies, equipment, salaries, travel, or other appropriate uses by the recipient. As a nonprofit organization, the EAS Foundation does not pay overhead on funded research grants. There will be one (or more) awards available in 2018; the total amount available for all awards is $10,000. The award will be announced at the EAS 2018 Conference but available by May 1, 2018. The principle investigator must present their findings at the 2019 EAS Annual Conference, and we will publicize the award to aid in solicitation of additional funds for subsequent years. Deadline for application is February 1, 2018. Additional submission details can be found at www.easternapiculture.org/honey-bee-research, and further inquiries can be directed to HoneyBeeResearch@easternapiculture.org. Proposals are welcome from any individuals conducting research on honey bees. The role the investigator will perform if awarded the funds should be clearly stated. Proposal should briefly outline the objective and a plan of work, to be completed within one year of funding, and a justification for the proposed work. If intended as “seed the proposal should clearly state how the funds will enable the investigator to secure additional funding for project continuation.Proposals should not exceed five written pages in total length (double-spaced) excluding title page, budget,and résumé. Only electronic submissions will be accepted. Proposal must indicate how results will be disseminated if grant is funded. Investigators must present their work to a future EAS annual meeting and through the EAS journal (in summary form) if at all possible,but other funds should be used for such dissemination. An acknowledgment of EAS support should be included in any presentations or publications resulting from the research. EAS will review each proposal with a three person proposal review board. One person is a member of the Board of Directors while the remaining two are researchers (the Board member may be a researcher). None of the panel will have a direct connection to any research project for which a proposal has been submitted. In cases of conflict that panel member will be excused from voting. 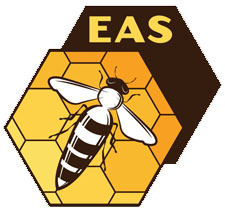 Evaluation of proposals will be made on the following criteria: scientific merit, relevance of the proposed project to beekeeping, reasonableness of the budget proposal to the actual work to be performed, potential for securing or adding to funding from other sources, and finally, interest of proposed research to EAS members. All funds must be expended by June 30, 2019 and an accounting of expenditures made available to the EAS treasurer by August 1, 2019.